This lively student housing block mixing traditional Bavarian design elements with Danish furniture and a laid back atmosphere is nestled in a 100-year-old factory in Berlin. New York-based real estate and design firm, Macro Sea revamped the old Roka manufacturing complex in the city's hip district, Kreuzberg, transforming it into a modern housing block for students living abroad. 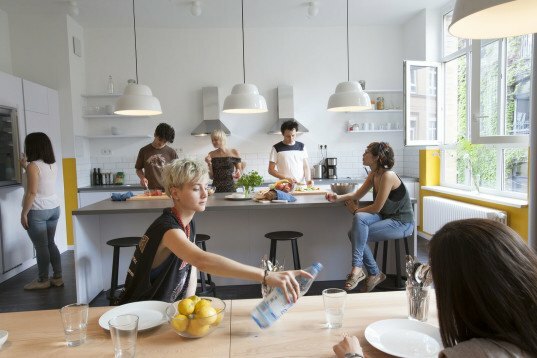 Featuring salvaged materials from the original factory and an atmosphere that encapsulates the Berlin lifestyle, this modern student housing is a great accommodation option for students looking for an informal and socially active environment. The G27 Global Institute is located in an existing building that may appear cold and impersonal, but this student-led housing concept offers a completely opposite experience. The interior layout and design reflects the spirit of the district itself – laidback attitude, vibrant social life and shabby chic reclaimed design elements. Macro Sea teamed up with the Council on International Educational Exchange, one of the largest non-profit study abroad organizations, to redesign the 85,000 square foot industrial complex dating back to the beginning of the century. 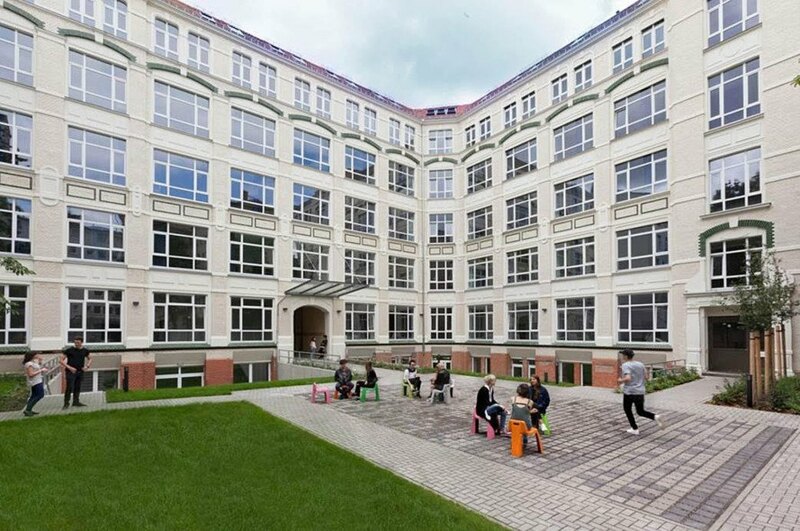 The five-story front building located at 27 building located at 27 Gneisenaustrasse will house the administrative offices and faculty apartments, while the large six-story factory building on the other side of the inner courtyard provides student accommodation. The bedrooms, designed in a minimalist way and featuring artifacts salvaged from the original property before it was demolished, can house over 200 students and can be customized according to individual preference. The design combines classrooms, dining areas and common living rooms, all of which act as a kind of “social incubator” which facilitates exchange and debate. “I really loved every step of this project, from the very first time we sketched it out on a napkin at 35,000 feet, returning from another international project. My wife is from Berlin, so it was really special to spend time there, particularly in Kreuzberg, one of Berlin’s most interesting neighborhoods. It was a pleasure to work with CIEE and having built many projects with Jim Pellow, I find him to be an innovator and thought leader in the changing field of international education,” said Macro Sea’s founder and President, David Belt. The G27 Global Institute is located in an existing building that may appear cold and impersonal, but is actually a student-led housing concept that offers a completely opposite experience. The interior layout and design reflects the spirit of the district itself-laid back, vibrant social life and shabby chic reclaimed design elements. Macro Sea teamed up with the Council on International Educational Exchange, one of the largest non-profit study abroad organizations, to redesign the 85,000 square foot industrial complex dating back to the beginning of the century. Featuring salvaged materials from the original factory and an atmosphere that encapsulates the Berlin lifestyle, this modern student housing is a great accommodation option for students looking for an informal and socially active environment. The five-story front building located at 27 Gneisenaustrasse will house the administrative offices and faculty apartments, while the large six-story factory building on the other side of the inner courtyard provides student accommodation. The bedrooms, designed in a minimalist way and featuring artifacts salvaged from the original property before it was demolished, can house over 200 students and can be customized according to individual preference. The design combines classrooms, dining areas and common living rooms, all of which act as a kind of "social incubator" which facilitates exchange and debate. “I really loved every step of this project, from the very first time we sketched it out on a napkin at 35,000 feet, returning from another international project. My wife is from Berlin, so it was really special to spend time there, particularly in Kreuzberg, one of Berlin’s most interesting neighborhoods." "It was a pleasure to work with CIEE and having built many projects with Jim Pellow, I find him to be an innovator and thought leader in the changing field of international education,” said Macro Sea's founder and President, David Belt.